Yamileh’s family is living presently in the outskirts of Port-au-Prince but is originally from a rural community. Yamileh is the second of three children, and her family lives with an uncle and his family. She is a first-generation university student. Her older brother has just finished his university degree, and a younger sister will soon finish high school. There are two younger cousins living in the household as well. 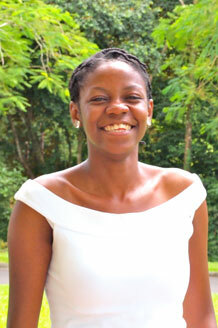 At the time she was accepted for enrollment at EARTH University, Yamileh was a student at the University of Haiti, in the faculty of linguistics. In her admissions interview, she spoke very convincingly of the connections between the communication arts and agriculture. She has very good communication skills and enjoys sharing her enthusiasm for agriculture. Yamileh speaks French, Creole, some English and now Spanish. She also enjoys singing, reading, dance, crocheting and embroidery, and being outdoors in nature. Yamileh has a good background in agriculture; she has been involved in agricultural production with her family since she was a child, as they have always tried to have some crops for their own consumption, mostly beans and corn. Yamileh learned a lot about plants from her grandfather, who was knowledgeable in the use of medicinal plants. She sees agriculture as a big opportunity for her country, as there is a lot of good land that is either misused or underused, mostly due to lack of information and knowledge on the part of small producers. Yamileh was attracted to the EARTH program because it not only focuses on sustainable agriculture, but on environmental stewardship and developing leadership. She notes that EARTH’s international community has taught her much about living and collaborating skillfully in a cross-cultural environment. For her entrepreneurial project, Yamileh is working in a student entrepreneurial company raising beef cattle. She has really enjoyed the project as a vehicle for practicing the knowledge she has gained in her classes. “You keep practicing the lessons, and that’s a real plus,” she shares. Monitoring the success of her project brings her great satisfaction, and she feels that the knowledge she acquires will easily translate to concrete skills she can use in Haiti someday. For example, she says, “You learn the recipe for the cow feed, and you can adapt it to whatever resources are available in your own country.” Yamileh feels glad, because she believes that Haiti truly needs greater expertise in the raising and management of cattle. By sharing her knowledge with her people, she hopes to contribute to society.